News that author Jonathan Smith donated book certificates to public school libraries, golf pro Daniel Augustus was awarded a $16,500 sponsorship, James Stout retained his Rackets World Champion title, the Museum Playhouse opened at the National Museum, and two new businesses — “Lifestyles” and “Sprinkles” — held their grand openings were some of the positive news stories this week. In other good news, Reggie Lambe scored for Mansfield Town, Ebony Magazine published an article teaching readers how to ‘ditch the winter blues in Bermuda,’ Clarien Bank launched its ‘Give Back Programme,’ CedarBridge Academy’s ‘I Am A Writer’ program will celebrate 17 students, the City of Hamilton donated $5,000 toward the Christmas Boat Parade, and Berkeley Institute instituting a new honours programme. We also posted various community photo galleries, including coverage of the motocross racing season kicking off, Saltus ‘Dress Like Your Favourite Teacher’, Plein Air Art Festival, Inwood Hunter equestrian show, Farmers Market, shoppers out at Black Friday, a UK magazine’s feature on Bermudian model Lillian Lightbourn, the School Debate Tournament and the Lighting of the Town in St George’s. In an effort to highlight some of positive news happening in our community, we supplement our standard morning and evening email newsletters with a special Sunday “Good News” email newsletter edition, which strictly focuses on the positive news from the past week. 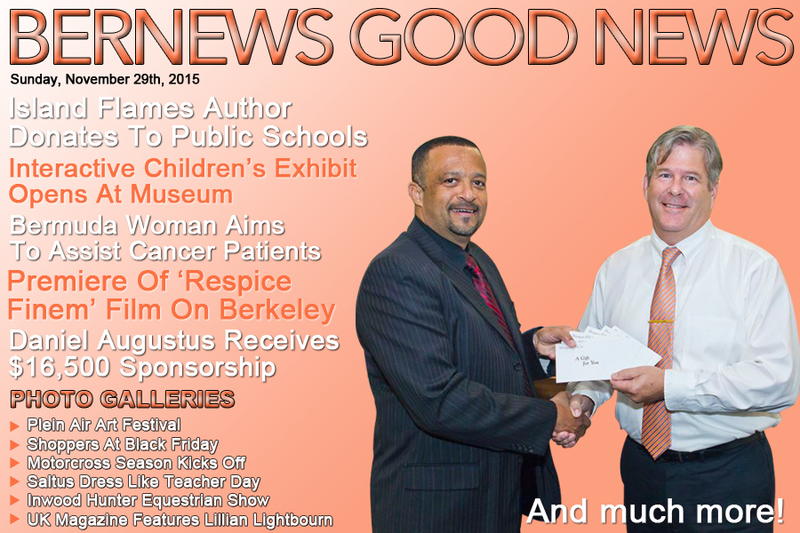 Congratulations Bernews on this weekly spotlight on Good News. The media is so often denigrated for covering only bad news but you show clearly that there is lots of good news right here in Bermuda, and much of it covered not only by Bernews but by our other media. Thanks for starting our weeks off in such a positive way.